Sorry this post is late! The week really got away from me. 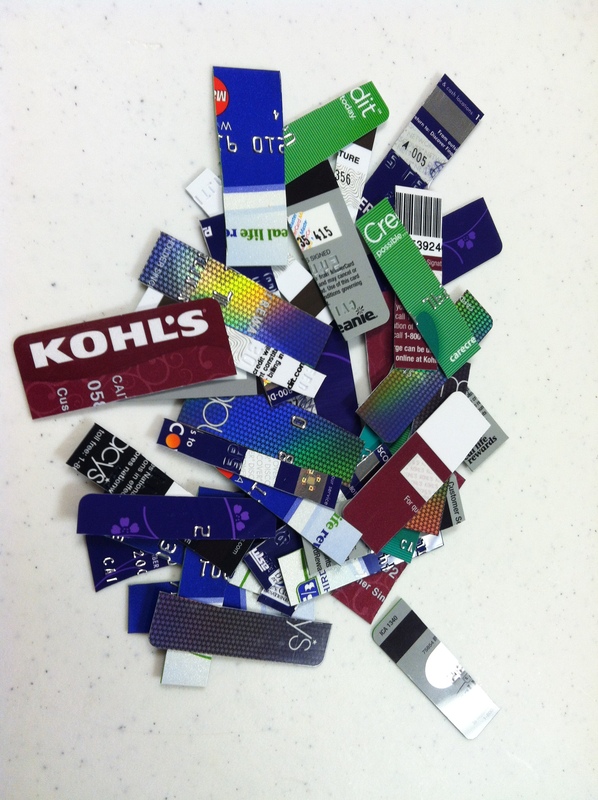 This week in FPU we talked about dumping debt (week 4). This lesson made me get really mad at my debt, which is a good motivator for getting rid of it. Debt is so aggressively marketed to our society that we think it’s the only way to get by financially. That is just not true. Just a couple generations before us, debt wasn’t something to be prized and sought, it was an embarrassment. Stop going into debt. This seems logical, but many people continue to use credit cards or take out loans after they decide to work toward being debt free. You can’t get out of a hole if you’re still digging. Sell something. I have been listing things on ebay and selling paintings for a little extra income. It’s slow going, but it’s a little bit of help. If I had gotten started before the weather started to turn, I could have had a yard sale. I’ll just do a bigger ebay push when I go through my apartment in the Great Fall Purge of 2013. Get a part time job or overtime. Check. If you have any spare hours, try to spend them working to get ahead of your debt. This is a sacrifice, but only a temporary one. Approach your goals with positive energy and intent. Dave Ramsey says that “prayer really works,” but I am giving you the non-denominational, sort of spiritual but not really religious way of putting that. My mother always told me, “What you think about, you bring about.” I totally believe it! If you go through this process thinking “I’m never going to get out of debt,” then you won’t. You’ll keep digging your hole, and you’ll make excuses, and you’ll stagnate. I don’t say this to be accusatory – I have had this attitude. I fully planned on paying my student loans for twenty five years of my life. I am 25. I was planning on making payments until I was 50! What? Helllllll no. Now, instead of “I’m going to be in debt forever, that’s just how it is,” I think, “I am going to get out of debt. I am going to do everything I can to get out of debt as fast as possible!” I have motivation, and drive, and passion to get out from under this terrible mountain of bad decisions I made for myself. Pay off all debt using the debt snowball. The debt snowball is something we’ve talked about before – list your debts smallest to largest and pay them off in that order, making the minimum payments on all but the smallest. For me, that’s the car, then a student loan, then another student loan. 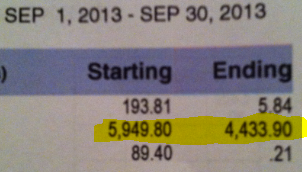 Speaking of the car, I got my statement in the mail and my balance is now $4,433.90! I still have October, November, and December to get it paid off by Christmas and I believe I can do it. I will do whatever it takes. Next will be paying off my smaller student loan by my birthday. Goal setting is something that is very important to me and my success at getting out of debt. I have been worried about my motivation lagging once I get to my big $49,000 loan, because it is SO big and will take me a long time to pay (but two to three years is way better than 25). I think my goal at that point will be to break it into $10,000 chunks and pay them off one at a time. I’ll call it $10,000 for every semester of graduate school. The highlighted portion is my car loan balance. Ignore the other numbers, they are my liquidated savings and checking accounts with the credit union… they have been SNOWBALLED. I’m going to turn them into artwork. Classic me. It sounds like you have done an awesome job getting debt paid down and I love how you have your goals set. I am pretty bad at setting goals, especially since I had a recent change in jobs and payment. Starting a job as an independent contractor has been a bit scary for me when it came to staying on track with paying down my debt. I had put a hold on adding money towards my college and car loans until I got a good handle on the new job. I will have some big checks coming soon, so I’m going to go ahead and pay off the college loan next month, which will leave me with $10k on the car. I plan to sell that within the next 6 months to a year and should be able to sell and make some money at the 10k. Keep up the great work – your posts are helping to keep me motivated! It’s so nice to know there are others trying to get rid of their debt too, and not just letting it continue to pile up. Thanks for your comments! I am glad these are helping, sometimes I feel like I am just a blathering pool of internet narcissism. I think selling your car would be a good plan, if you can get by with something cheaper! Oh yes, goals help! I set goals to pay off my college loan and I’m almost there, but I didn’t really set a time limit necessarily. I knew I wanted to pay it off as quickly as possible, so I have just been throwing money at it every time I can. That’s essentially what I’m doing too, it just really helps me to write it all down and work on a deadline for motivation. I’m worried about the really big one but I think I’ll do okay 🙂 it’s awesome you are working so hard! I can think of nothing better to do with those cards than turn them into art! Just think of the motivation it will give you to see the debt displayed beautifully to spur you on to pay off your college loans too. I an shocked to see the amount of debt todays college student rack up. I hear all the time how a college graduate will earn more but with that kind of debt I’d rather earn a bit less. I graduated from college at the end of 1990, my tuition per semester was $2,500. What a change in the last 20 or so years. have you read The Millionaire Next Door? I read it many years ago. It helped me to see how far I had strayed from my upbringing and has stayed with me ever since. I haven’t read it but it is officially on my list! I went to a private college with a $30,000 a year price tag. Scholarship covered half, and I had some more scholarships and grants, but still came out with some loans. If I had stopped there I would be okay, but grad school was $10,000 a year (x2 years) and I took out $40,000 in loans to live off the excess. Big mistake! But at least I am learning now instead of continuing down the path I started down. It is really crazy how much college costs, but the state schools are still reasonably affordable. One of the reasons I went into Higher Education Administration for grad school was to work at a college and have my kids’ college paid for by the school where I worked. That line of work is far, far too much of a time commitment, especially for the compensation. While there is something to be said for playing a part in touching students’ lives and guiding them, it’s more important to me to guide my own children instead of working long hours. And if I don’t get the tuition benefit, I guess I will just have to save up MONEY! I was listening to the Dave Ramsey show last night and someone called in to say his girlfriend had $300,000 in debt from college and just accepted a $60,000 a year job. O.M.G. I would explode. I really love that you keep sharing these money makeover posts! I’ve been reading each and every one of them, and it inspired me to turn my household’s finances around. After 4 hours on the phone with my wireless provider, I have officially gone to a prepaid cell phone with no data. Giving up my iPhone is going to be very hard, but I should save $500, yes, $500 a year! All in all I have cut around $2,400 of yearly expenses and started the envelope system in an effort to go all cash. I’m feeling great about all these changes so far (other than my poor iPhone, lol.) Anyway, thanks for all the awesome inspiration and keep up the great work!!! Yayyy good for you!! That is AWESOME! Keep up the hard work. I still have my iPhone. I keep eyeing it though. Who knows? Love it! I too am working towards becoming debt free!